Construction update as of 11/26/18: The ThrU-Turn signals are active! The project was considered substantially completed as of November 13, 2018. Crews are working on the north side of State Street. Excavation, pipe installation, and placement of base gravels is complete. Concrete paving started June 5th and will continue into early July. Work will be done at night. Construction update as of 6/7/18: The first concrete has been poured for the new intersection, on Veterans Memorial Parkway, or the southern leg. ACHD favors concrete for major crossroads because it will last for several decades with minimal maintenance, giving the traveling public a smoother ride and saving tax dollars in the long run. Traffic will be shifted onto the new pavement on Veterans Memorial Parkway and 36th Street on the night of June 28th. After the 36th and Veterans Memorial traffic shift there will temporarily be only one northbound lane on Veterans Memorial. This will impact the Friday morning commute on June 29th and weekend commuters. Two northbound lanes will be restored by Monday morning, July 2nd. Traffic will be shifted onto the new pavement on the north side of State Street on the night of July 17th. While obstructions are being removed pedestrian traffic will shift from the south side of State St. to the north side. Detour routes will be signed and will be at Willow Ln. and State St. (west side) and at Idaho Transportation Department (ITD) (east side). Also, the High-Intensity Activated crosswalk Beacon (HAWK or a Pedestrian Hybrid Beacon) located to the west of the State/VMP/36th intersection (just past Arthur St.) will be removed to provide space for the temporary paving needed for construction. This signal will remain down for the duration of the project (February to October). Sign up to receive e-mail construction updates. Attend the January 25 open house (more info below). Learn how the new intersection will work! 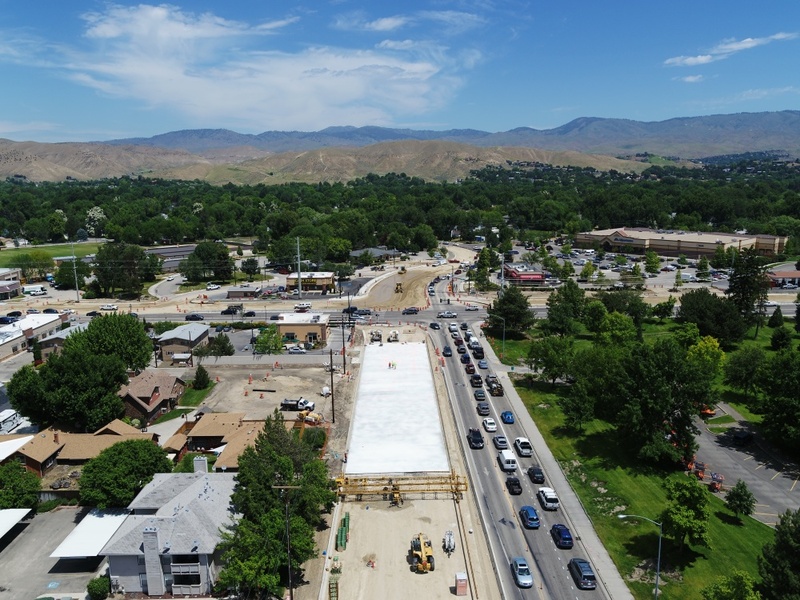 The Ada County Highway District (ACHD) and Idaho Materials & Construction are rebuilding the intersection of State Street, Veterans Memorial Parkway and 36th Street. Utility work began in January and construction will start at the beginning of February. Work is expected to be complete in fall 2018. What can neighbors & commuters expect? Left turns at the intersection may be restricted, with detours in place. Work will include, but not be limited to, general construction noise, dust, equipment back up alarms, and ground vibration. Updates - Sign up to receive e-mail construction updates. Watch - Learn how the new intersection will work. Watch the video! A ThrU-Turn (Partial Median U-turn) intersection is unique to this part of Idaho. Click here to see how a ThrU-Turn will work at State, Veterans Memorial and 36th Street. Agencies throughout Ada County have been working since 2004 to develop a vision for the State Street corridor. State Street is envisioned as a transit corridor with increased regional, express and local bus service, and high occupancy vehicle (HOV) lanes. The future HOV lanes adopted by the State Street Plan will be dedicated for buses, multiple-occupant vehicles, and right-turning vehicles. View the open house displays and handouts under "Related Documents" to the right of your screen. After reviewing the materials, please take the survey below. On March 27, 2013 the ACHD Commission voted to adopt the State Street/Veterans Memorial Parkway/36th Street Intersection Study concept report and preferred alternative #9 (Partial Median U-turn/ThrU-Turn). The Ada County Highway District (ACHD) and the City of Boise are working together on a study of the State Street/Veterans Memorial Parkway/36thStreet intersection area, a neighborhood that features a popular park, an elementary school and a variety of businesses. The goal of the study is to design an intersection that will efficiently and safely meet the future needs of all users - motorists, pedestrians, bicyclists and transit users. Click on the images below to review the displays and maps from the open house. Click on the images and links below to review the displays and maps from the open house. Individual versions of the displays and maps can be found under "Related Documents" on the right. Click on the links below to learn how each intersection works. Learn about the State Street Alignment Study and recent public outreach. Learn more about the State Street corridor and past efforts.